The Internet and social media platforms provide a space which qualifies their users to explore them for their various objectives. Muslim women are among the active users who have taken benefit from the rapid development of these digital technologies. Despite the presence of a gender digital divide in some Muslim majority countries, currently, these countries witness the growing presence of women’s voices on the Internet and social media platforms. A digital divide, due to a gap in Internet penetration rate, is evident in many countries. This, however, does not hinder the rise of a digital culture and the participation of Muslim women within it. The Internet and social media platforms have become integral for tech-savvy Muslim women and play diverse roles in their identity construction, not only through the consumption of religion online and their online religious activities. The ability of the Internet to give these women an open and anonymous space has led to the proliferation of diverse cyberactivism expressions ranging from those who use the Internet and social media platforms to voice their concerns regarding gender inequality to those who use it to accentuate their versions of true expressions of Islam. The digital platforms have also led to an increased fragmentation of authority in Islam. Islamic discourses are no longer monopolized by religious elites or ulama, especially male elites. The online environment has boosted the presence of the voices of these women – voices that reflect diverse, segmented, and fragmented Islamic public spheres. The presence of the Internet was welcomed with enthusiasm by religious adherers from diverse religious traditions, despite the existence of a handful of ultraconservative religious groups and elites who have negative or cautionary views against the Internet (see, e.g., Campbell 2007). In December 1996, Time magazine published a special issue on religion online (Campbell 2005, p. 311). The phenomenon of the presence of religious websites was underscored in this issue. At the time, Yahoo could be regarded as the only most popular web directory. Google was founded later in 1998, and following Google today, there are various social media platforms which can be used for diverse religious causes, such as Facebook, YouTube, Twitter, WhatsApp, Pinterest, Instagram, and Tumblr. This means that the manifestations of religion online and online religion have become more diverse. The Internet has also become a crucial platform in the growing visibility of secretive religious groups in the online public environment. This, for example, can be seen from the increasing online presence of neopagan, pop culture paganist, and magic communities (Fernback 2002). The possible interface of religion and cyberspace has been the main focus of many scholars who write about the role of the Internet in religion. Turkle in her study of cyberspace in human’s life asserts that “the use of the term ‘cyberspace’ to describe virtual worlds grew out of science fiction, but for many of us, cyberspace is now part of the routines of everyday life. When we read our electronic mail or send postings to an electronic bulletin board or make an airline reservation over a computer network, we are in cyberspace” (1995, p. 9). Today, believers from diverse religious traditions have treated cyberspace as an integral part of becoming true believers. Issues regarding the potential recruitment of believers to certain religious movements through the use of the Internet have occupied scholars since the presence of the Internet (Dawson and Hennebry 1999, p. 21). The Internet’s economic and accessibility aspects have led elites in diverse religious movements to use the Internet to strengthen their influence. Studies of Islam and the Internet have mentioned that Muslims’ eagerness to accentuate their identity or Muslimness has been among their earliest interactions with the Internet (Larsson 2017). 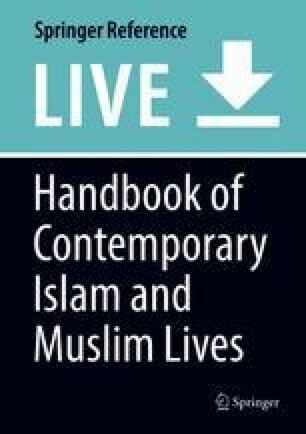 Today, more tech-savvy Muslims engage with the Internet in the context of “painting” and “repainting” their identity, evidenced by the interaction of Muslim women with the Internet in this chapter. Scholars also focus their attention on the fragmentation of authority in Islam, mirrored in the activities of Muslim theologians, Islamists, extremists, and lay tech-savvy Muslims speaking in the name of their religion on diverse social media platforms (Bunt 2003; Gräf and Skovgaard-Petersen 2009). In 2018, Indonesia, the largest Muslim country in the world, had the fourth highest number of Facebook and Instagram users in the world. All the studies mentioned above relate mainly to male Muslims. This chapter specifically focuses on the role of the Internet in the life of Muslim women, in particular, young tech-savvy Muslim women who are the most active Internet and social media constituents. (This chapter is a result of the research project “Islamic (Inter) Faces of the Internet: Emerging Socialities and Forms of Piety in Indonesia” (FWF P26645-G22) funded by the Austrian Science Fund.). It analyzes the position of Muslim women not only as consumers but also as producers or active players in the online Islamic public sphere. Scholars have emphasized the plurality of religious expressions online in addition to the possibility of Internet users to continuously touch and retouch their online presentation to deliver hyper-idealistic versions of themselves. Muslim women have been particularly active in crafting religious identities online through diverse platforms. Having been inspired by scholars, like Cohen (1993), who focus their work on how identity is not fixed and continuously constructed and contested, this study will focus on how Muslim women build and perform their online religious identity. Cohen treated identity as “…the way(s) in which a person is, or wishes to be, known by certain others” (1993, p. 195). This chapter demonstrates the way these tech-savvy women feel empowered due to their ability to express their identity through the Internet. In addition to this, the presence of the Internet and social media platforms has also led to a more egalitarian online public sphere which, in this context, is manifested through the presence of diverse voices of Muslim women in the Islamic public sphere online. The ability of the Internet to provide these women an open and anonymous space has enabled the proliferation of diverse cyberactivism expressions ranging from those who use the Internet and social media platforms to voice their concerns with gender inequality to those who use it to accentuate their versions of true expressions of Islam. Muslim women are active consumers of the Islamic public sphere online, especially young Muslim women who are in the stage of identity formation. For many of these young women, the Islamic online atmosphere plays a crucial role as their resource for identity development. Some studies have mentioned the role of religion and spirituality in general as resources for identity formation for young generations (King 2003). The advent of the Internet has made it clearer to see the role of religion in the identity development of these young women. The gender digital divide, a common term used to refer to “the disparities in access and use of ICTs [information and communication technologies] by women and men” (Huyer and Sikoska 2003, p. 2), is the reality that is present in the world. This gender digital divide is resonant with the gender gap in various aspects, especially education, literacy levels, and income. However, despite the presence of women as part of a marginalized group of Internet users in some countries, there is a growing Internet literacy among Muslim women. In addition, some quantitative research mentions that women, in particular, use social media platforms more than men, especially Twitter, Facebook, Instagram, and Pinterest (Grant 2017). A study on Muslim women in Southeast Asia in 2017 by the Innovation Group’s APAC also recorded that the most popular social media tools used by these women were WhatsApp, Facebook, and Instagram (The Innovation Group’s APAC 2017, p. 7). My research on Muslim online community groups since 2014 also demonstrates that women are more active in Islamic public sphere online communities. Women’s active engagement in the Islamic public sphere online, including a higher level of online religious involvement, is resonant with women’s higher levels of offline religious involvement and women’s higher attachment to religious groups. Scholars focusing their work on gender difference in religious activities from diverse religious traditions often emphasize this aspect – that women are more religious than men – although there is some discussion that this phenomenon is culture-specific. Studies have mentioned diverse indicators to strengthen the argument that women are more active than men, such as their level of attendance in houses of worship and religious study gatherings, visits to temples, reading of holy books, conducting of certain prayers (puja) at shrines built in homes, and a high rate of success in religious movement recruitment of women in comparison to men (Stark 2002, p. 495). Women’s access to a place of worship often raises certain hotly debated issues; in some Muslim countries, however, they are creative in creating their own women-friendly places to learn about religion. Although some conservative Muslims often emphasize that women need to guard their modesty, even in the virtual world, access to the Islamic public sphere online, however, is not part of the critical debates among Muslims. Therefore, the gender digital divide in the Islamic public sphere online is mostly not an issue. A digital divide among women themselves is also present. Those who are most active are the young generations aged between 18 and 29 years, followed by those between 30 and 49 years of age. Bunt, for example, emphasizes “it is recognised that computer technology is not accessible to all, and the ‘digital divide’ is a prominent factor in many Muslims societies” (2003, p. 205). Although education and socioeconomic background are important aspects in the digital divide, the presence of cheap or free Internet access and the fact that diverse applications can be accessed easily by both educated and uneducated women, age becomes one of the important determinants in the digital divide. Many young generations are usually more versatile and prepared to develop digital literacy to fully or fairly participate in an increasingly digital landscape. Therefore, this study mainly focuses on young tech-savvy users. Many studies have also mentioned how both genders have used social media sometimes in a different way and for a different reason (see Vermeren 2015). While women are more active on Instagram, Pinterest, Facebook, and Twitter, men are more active on Google+, LinkedIn, and YouTube. Muslim women are also more active than their male counterparts in terms of demonstrating their Islamic identity on social media platforms, like posting self-portraits in Muslim attire. The number of women who “shop” in the Islamic public sphere online also exceeds male Muslims. Therefore, it is not surprising if some popular Islamic websites – in terms of total visitors and traffic – are active in catering to women. Mohammed el-Nawawy and Khamis, focusing their studies on three popular Islamic websites, www.islamonline.net, www.islamway.com, and www.amrkhaled.net, recorded that “Many of the issues addressed through Islamonline revolve around women’s issues, such as raising children and the wife’s relationship with her in-laws”(2009, p. 13). Besides Islamonline, they also noted that another popular Islamic website, islamway.com, had a highly homogenous female audience (2009, p. 16). As consumers, these women will “shop” for Islamic teachings posted by the ulama (religious scholars) of their groups. Many of them will follow social media accounts belonging to the ulama of their choice. Ernst notes, “…in the proliferation of online texts that characterises the contemporary information age, it is especially important to read critically the controversial material that appears on Internet sites attacking and condemning opposed points of view” (2003, p. 36). This kind of contestation can be seen clearly from the ways followers of diverse online Islamic groups condemn others who do not belong to the same ideology. Many of these Muslim women are intentionally active in searching Islamic websites, in particular daʿwa (proselytisation)-oriented websites – managed by Islamic organizations, think tanks, or Muslims who are enthusiastic in daʿwa – which are countless, or following social media accounts of famous Muslim scholars and popular preachers, such as Sheikh Yusuf Al-Qaradawi who is famous for Internet portal Islamonline.net, Amr Khaled (amrkhaled.net), Zakir Naik, Mufti Ismail Menk, Bilal Philips, Abdullah Gymnastiar (Aa Gym), and Nouman Ali Khan, to help them construct their identity (see Bunt 2003; Gräf and Skovgaard-Petersen 2009). Muslims living as a minority, in particular, find digital media as their niche that can help answer problems pertaining to their lives from Islamic perspectives. This advanced technology has helped them learn more about their religion and find guidance and serves as a safe, anonymous space to ask for religious opinions and advice (fatwa). The digital networks have inundated Muslim women with diverse types of fatwa providers, including the presence of those who do not have formal religious education but have religious zeal to spread their version of Islam (see Bunt 2003). Therefore, the Internet and social media platforms are important elements in the process of “becoming” for these women. They feel that the Internet has empowered them as the true seekers of their true version of Islam. They feel empowered because they can choose and decide whose version of Islamic teachings is worthy to follow. Mushrooming numbers of daʿwa websites are managed by Muslims from diverse religious affiliations, ranging from the Saudi Salafi daʿwa websites such as “fatwa-online” and one of the most influential Salafi clerics in Saudi Arabia, Shaikh Muḥammad b. Ṣāliḥ b. Sulaymān b. ʿUthmān’s (1929–2001) site “binothaimeen.net,” “ikhwanweb.com” of the Muslim Brotherhood, “fgule.com” belonging to one of the largest daʿwa movements in Turkey, “isna.net” a daʿwa website of Muslims in America, and diverse Shiʿite daʿwa sites, such as the two most popular websites of the Twelver Shiʿite Islam, “al-shia.org” and “aimislam.com.” Indeed, the Internet and social media platforms have highlighted the competition and conflicts between diverse ideologies. Teitelbaum, for example, analyzes the introduction of the Internet in Saudi Arabia and the phenomenon of competing daʿwa, in particular in relation to the efforts of the Saudi government in introducing its version of Islam (2002, p. 228). It is noteworthy, however, that some of these women are not aware whether the sites they often visit are indeed propagating conflicting ideologies. Therefore, during my research on daʿwa and the use of the Internet and social media platforms, it was not uncommon to meet women who expressed anxiety and confusion relating to the presence of competing daʿwa online. The vibrancy of these online contemporary daʿwa have often led many Muslim women, especially youth who are still in the stage of pursuing the right path, to end up in misleading sites, including extremist sites that spread radical interpretations of Islam. Halldén, in his study of militant Salafism site Alneda.com which was created in 2001 soon after the 9/11 attacks, also argues that some of the websites which could be considered as belonging to the Al-Qaida network were “homepages belonging to unruly teenagers” (2006, p. 75). In addition, the Internet – like its predecessors such as audio and video cassettes – works for both audience and preachers, as a medium that facilitates preachers to connect directly with congregants and project diverse influences in the lives of congregants. The Internet and its diverse social media platforms also assist them to interact directly and intimately with the ulama without feeling shy. Slama in his study of the uses of social media for religious purposes in Indonesia also argues how the female Indonesian middle-class Muslims of various majelis taklim (religious gatherings for learning Islam) enjoy the presence of social media in facilitating more intimate relationship with their religious teacher (ustadz) (2017). He asserts, “On social media…a mix of speed and privacy produces the intimate and affective relationship that many middle-class Muslim women are seeking” (2017, p. 101). There is often a tendency, in a mixed religious circle, for female congregants to not be as active in terms of verbal exchange as their male counterparts, who often raise questions. This especially relates to the belief upheld by some ultraconservative Muslim women that they have to silence their voices in public. In contexts where women face mobility restrictions in the public sphere, such as in Saudi Arabia, the Internet can serve as a means of liberation. Teitelbaum argues that the use of the Internet in the Kingdom is “a growing and perhaps unexpected phenomenon” and, the fact that they have to face severe restrictions to go out their homes without their maḥram (someone whom Muslim women are forbidden to marry), the Internet, Teitelbaum asserts, “has opened up an entirely new arena for gathering information and for socializing, and one does not have to leave the house in order to do this” (2002, pp. 233–4). Wheeler, focusing her study on Internet usage in Kuwait, also mentions the same phenomenon in which the Internet has enabled women to bypass traditional formal barriers that separate them from their male counterparts. In the context of Kuwait, she asserts that the most active users of this new media are women, youths, and Islamists (Wheeler 2017, pp. 93–95). Wheeler also emphasizes how the Internet has provided new opportunities and freedoms for Kuwaiti women and the young generation. She contends, “women who used the Internet gained room to manoeuvre, interact and voice opinions in ways culturally prohibited in face-to-face engagement. Ultimately Kuwaiti women would use new media tools to gain their voting rights…, and even seats in parliament…) (2017, p. 94). Similarly to offline religious movements of diverse religious traditions in which women’s attendance outnumbers men, as mentioned above, Muslim women are also the backbones of many online religious movements. For example, Instagram da‘wa accounts which focus on providing religious advice and ethical guidance for followers and lurkers are mainly inundated by female online digital users (Nisa 2018b, p. 75). The presence of women in one of the biggest, semi-virtual, socioreligious movements in the largest Muslim majority country, Indonesia, One Day One Juz (ODOJ), is a notable example (see Nisa 2018a). ODOJ encourages and monitors Muslims to read the Qur’an daily, at least 1 section out of 30, through the use of mobile application WhatsApp. Each ODOJ is a member of an ODOJ WhatsApp group consisting of 30 people. Every day, ODOJ admin (administrators) enter the lives of members to remind them to read 1 section (juz) of the Qur’an, consisting of 30 sections. This means that every day each WhatsApp group can finish reading one whole Qur’an. In 2017, ODOJ has successfully recruited more than 140,000 followers in Indonesia and abroad, and 70% of the members are women (Nisa 2018a, p. 29). In 2014, ODOJ had 3124 female WhatsApp groups and 979 male WhatsApp groups. As mentioned above, this number echoes other scholars’ arguments on the higher presence of women in offline religious gatherings, including belonging to religious communities and church attendance (see Stark 2002). However, in contrast to the offline dynamic in which men have often dominated the rank of leadership in various religious communities, the online dynamic is more egalitarian, because anyone can create an online religious community. Tech-savvy women, therefore, are not only followers or lurkers of established da‘wa digital communities. Rather, young, creative, tech-savvy female Muslims have also been zealous in creating and maintaining online religious communities. Thus, as many scholars have argued, the fragmentation of online religious authority is more prevalent. The following section will further discuss this phenomenon. At the moment, Muslim women can be seen not only as the consumers of Islam online but also the main players in online religion and religion online. The technospace has played an important role in providing a stage for them to express their version of Muslimness. Diverse expressions of religiosity are present on the Internet and social media platforms. Young, female, Muslim activists have long been using the Internet and social media platforms to voice their concerns and campaigns to gain broader attention, including local and international media coverage. Wendy Harcourt’s edited book Women@Internet (1999), which published 17 articles on the use of the Internet by women in voicing their various agenda, is an important early contribution to the discussion of women living beyond the developed world and the cyberspace. Although the book does not focus on Muslim women specifically, women in majority Muslim countries are part of the discussion. One of the focuses of this collection is the way women use the Internet to build global networks and share resources to achieve their goals, strengthen their specific agenda, and transform their lives. The development of Islamic feminism has benefitted largely from the Internet. Gender-egalitarian rereading of the Qur’an and other Islamic sources has circulated globally due to the assistance of the Internet. Badran, known for her influential work on Islamic feminism, contends “Islamic feminism/s, bursting on the scene in the midst of the cyber age, have exhibited from the start a special dynamic of ‘heres’ and beyond” (2005, p. 13). The agenda of the gender struggle for gender justice or “gender activism,” to borrow Badran’s term, from one locality to other parts of the world can traverse swiftly because of the Internet. The articles published by Sherkat’s Zanan, an Iranian women’s magazine launched in 1992, on gender-sensitive rereadings of Islamic texts, for example, can be accessed speedily by other gender activists beyond Iran. Articles and reports published by Musawah, launched in 2009 as a global movement for gender equality and justice (Mir-Hosseini 2016, p. 66) as well as those of Sisters in Islam, a Malaysian nongovernmental organization for women’s rights and gender equality founded in 1988 (Mir-Hosseini 2016, p. 71), can be read and retrieved by other gender activists around the globe straightforwardly. Badran argues, “This time it was electronic technology that circulated information and ideas freely and rapidly through cyberspace, creating an unprecedented simultaneity of local and global production” (2005, p. 9). It is noteworthy, however, the older generation of Muslim women activists are not as active in the online sphere as the younger generations. Hosni (2017), in her study of Egyptian cyber feminism, states that renowned feminists like Nawal El Saadawi were not as active as the younger generation in the cybersphere. She says, “The younger generations of Egyptian females – including nationally and internationally renowned activists and hundreds if not thousands of young women – have established a significant presence in the cybersphere, whether via formal e-organizations or informal social media networks such as Twitter and Facebook” (2017, p. 11). The political cyberactivism of these women can be seen, for example, in the successful mobilization they conducted through the Internet, like the Revolutionary Association of the Women of Afghanistan (RAWA). RAWA, through its website founded in 1997, is regarded as a pioneer of the Internet mobilization of Muslim women (Piela 2018). Women were also active agents in the Arab Spring. They were mostly young, such as 26-year-old Rowan El Shimi who called women on her blog to participate in the “Million Women March” for social justice and change in Egypt in 2011 (Hosni 2017, p. 199). In addition, Asmaa Mahfouz, who was known also as the “leader of the revolution” and “the most brave girl in Egypt,” raised to fame during the Egyptian uprising (Al-Ali 2012, p. 27; Khamis 2017, p. 12). She called young people to go out and join the demonstration on her YouTube vlog on January 25, 2011 (Al-Ali 2012, p. 27; Khamis 2017, p. 12). Her viral video inspired thousands of participants to protest on January 25 (Hosni 2017, p. 202). Hosni notes that Mahfouz’s viral video “was also acclaimed for helping to inspire the Egyptian government to block Internet facilities” (Hosni 2017, pp. 202–203). The nature of virtual freedom which limits the government’s control has led these women to find a new sanctuary for their counter-hegemonic understandings of the position of women. The capacity of the Internet and social media platforms to traverse the borders has enabled women activists across the border to support and influence each other (Hosni 2017). Ernst also argues, “International financial networks, multinational corporations, media conglomerates, and the Internet have now created a world in which it is impossible to keep one culture isolated from the rest” (2003, p. 4). Some studies have also mentioned the importance of the digital media in facilitating women from various cultural backgrounds and diverse countries to exchange their views and opinions about diverse gender-related issues (see Piela 2012), including their experiences of wearing Muslim dress in various contexts (see, e.g., Akou 2010). The latest political cyberactivism by Muslim women was the #MosqueMeToo movement initiated by Mona Eltahawy, an Egyptian-American feminist and an award-winning journalist. Eltahawy criticized diverse aspects of injustice which led her to be banned from publishing a weekly column on Asharq al-Awsat, the Saudi-owned international Arab publication (Hosni 2017, p. 197). In the #MosqueMeToo movement, Eltahawy was inspired by a young Pakistani woman, Sabica Khan, who posted her experience of sexual harassment when she conducted hajj (pilgrimage) on her Facebook account. In February 2018, through her twitter campaign, Eltahawy empowered women to speak up of their experiences of being harassed in sacred places. BBC recorded that the hashtag #MosqueMeToo went viral in less than 24 h and was tweeted 2000 times, becoming 1 of the top 10 trends of Farsi Twitter (Amidi 2018). It is important to note that some women activists who are engaged in political cyberactivism to counter pejorative yet hegemonic understandings of gender inequality have to face opposition, including prosecution from conservative regimes and extremist movements (see Hosni 2017). The cyberactivism of Muslim women in Saudi Arabia, for example, has met great opposition from the socially and politically conservative Muslim country. The most controversial cyber-collective movement in Saudi Arabia has been Women to Drive Movement which tries to fight for the right of women to drive. The day before International Women’s Day in 2008, Wajeha al-Huwaider, a co-founder of the Association for the Protection and Defense of Women’s Rights in Saudi Arabia, posted a film of herself driving on the YouTube account “Yes2WomenDriving.” In 2011, al-Huwaider’s step was then followed by another famous women’s activist, Manal al-Sharif, who started a Facebook campaign with other Saudi Muslim women called “Women2Drive.” Following this, al-Sharif posted a video taken by al-Huwaider when she drove around the city in May 2011 on YouTube and Facebook. Al-Sharif was arrested the following day and released on bail. Some Saudi women responded to al-Sharif’s campaign by following her steps in using social media to voice their concerns. Wheeler contends that “By using the internet to distribute their call for change, the Woman2Drive movement has gained wide recognition in the global media…and also garnered a complex web of supporters, crossing gender, social class and national boundaries” (2016, p. 122). In 2012, another Saudi woman used social media platform YouTube to film her opposition toward the moral police (muṭawwa’) who asked her to leave a shopping mall for wearing nail polish which is considered “sexually suggestive and a violation of public morality” (Wheeler 2016, p. 123). Those who have been engaged with cyberactivism are not only women activists and Islamic feminists but also women belonging to Islamist ideology. Before the Arab Spring, as Hosni noted, these Islamist women were more active in closed forums; during and after the revolution, they have become more active in cyberspace (2017, p. 203). One of the most prominent Islamist women, who has been active in supporting the Islamist political agenda, was Azza al-Garf – a prominent figure in the Freedom and Justice Party of the Muslim Brotherhood and an active online supporter of Morsi’s regime. Muslim women are active agents in both the political public sphere and the Islamic online public sphere to spread diverse messages of Islam and online daʿwa. Muslim women have been active, at least, in sharing their stories and advice to “sisters” facing diverse problems specifically related to women’s issues. One of the most often mentioned problems is the adoption of modest Muslim dress and veiling, particularly in Muslim minority contexts (Akou 2010, p. 345). A website which discusses veiling is thecanadianmuslim.ca (Akou 2010). Akou, in her study of thecanadianmuslim.ca’s “hijablog,” depicts how women from diverse countries joined the group, shared their thoughts and stories about veiling, and supported each other. These transnational virtual conversations which bring Muslim women into one discussion platform would not be possible without the presence of advanced digital technology. It is through digital platforms that many Muslims become aware of the vast diversity in conditions and problems faced by veiled women. Women within this virtual platform, who work to support each other and find solutions for their “sisters’” problems relating to faith, also play a vital role in becoming virtual brokers who provide users of the virtual platform with exposure to veiling practices on the local and global levels. In the broader sense, these women are part of what Anderson called “new interpreters” of Islam (Anderson 1999). The presence of women’s voices further has strengthened the fragmentation of online religious authority (Anderson 1999; Piela 2012). Men, or in this context male ulama, do not dominate the online domain, especially not the daʿwa scene. Therefore, the online public sphere does not exclude marginalized women. Some studies of the public sphere criticize Habermas’ homogenous bourgeois public sphere which discriminates and excludes some marginalized groups, including women (see Fraser 1992). Having been inspired by Spivak’s concept of “subaltern” and Felski’s concept of “counterpublic,” Fraser proposes the concept of subaltern counterpublics referring to the existence of discursive arenas “where members of subordinated social groups invent and circulate counter discourses to formulate oppositional interpretations of their identities, interests, and needs” (1992, p. 123). It signifies the existence of various public spheres formed by marginalized groups which also accentuates a more egalitarian view of the public sphere. The number of Muslim women’s religious online communities which exceed that of men in many Muslim majority countries (see Hofheinz 2005; Nisa 2018b) supports Fraser’s multiple publics. In addition to this, the presence of fragmented and segmented Internet websites offering segmented teachings of Islam also strengthens the presence of various Islamic public spheres online. Earlier, religious women often used blogs to construct and perform their identities (Campbell 2012, p. 72). However, the use of a blog can be quite segmented. Religious bloggers are usually those regarded as gifted writers who can write persuasive and interesting stories about their identities and their process of becoming. Others who do not have the ability to share their journey were usually positioned as consumers of the stories produced by religious bloggers. Today, the proliferation of social media platforms has enabled Muslim women to share their pursuit of identity not only through writing a long story like what religious bloggers usually do but also posting a word, a short sentence, or picture with powerful religious messages (Nisa 2018b). Posting one verse of the Qur’an with a translation for the given audience accompanied with the photo of the account holder is common and proven to be an effective way to influence online followers. In the domain of Islamic propagation, active users of the Internet and its social media platforms are not only female preachers (Makboul 2017, p. 320) but also younger generations who have the zeal to spread messages of Islam through diverse creativities including young content creators on Instagram, one of the most popular photo-sharing visual platforms, whose presence is mushrooming (Nisa 2018b). Instagram, in particular, emphasizes visual content and a culture which differs to other social media platforms such as Twitter and Facebook, which mainly focus on text content rather than visual. These young content creators are active in conducting soft and light daʿwa by posting motivational quotes to inspire other young generations to be closer to their religion (Nisa 2018b, p. 69). The number of Instagram daʿwa created by young Muslim women in Indonesia, for example, exceeds those of men. The content creators usually try to adjust to the taste of these women. Therefore, in their soft daʿwa, the content creators usually use female caricatures, soft colors, and messages to touch the hearts of young women (Nisa 2018b, p. 73). Many of the graphic designs in soft daʿwa reinforce existing gender preferences (see also Makboul 2017, p. 320). The proliferation of young female content creators on the Internet and its diverse social media platforms has helped other Muslim sisters in developing their identity. El Nawawy and Khamis argue that “It is easier to build on and reinforce a religious identity that is already established in the offline community than to create an identity from scratch in the online community” (2009, p. 76). This can be true in the early phase of the growth of social media platforms. Today, however, it becomes more difficult to separate between online and offline activities of Internet users because many users often do not maintain the distinction between their online and offline worlds. In addition to this, there have been many cases demonstrating how believers move from one religious group to another because of the influence of the Internet. Studies on radical Muslims and their journey to be part of an extremist movement, for example, demonstrate the phenomenon of the formation of these radical Muslims’ identity through the Internet (Bloom 2011; Nisa and Faried 2018). Bloom argues that the Internet has enabled the “dissemination of radical ideologies online. The Internet has afforded jihadi women…the opportunity to participate in jihad without affecting their inferior status in society” (2011, p. 207). The use of the Internet and social media platforms facilitate these women to reach larger audiences for their religious messages. In her study of female preachers in Saudi Arabia, Makboul, for example, argues “With the advent of the Internet, and the introduction of social media, intellectual female preachers’ messages have the potential to permeate Saudi society more widely than before, as well as to cut across traditional gender segregation” (2017, p. 320). The issues relating to strict gender segregation understanding, like in Saudi Arabia and some other Muslim countries, become easier to navigate with the Internet and social media platforms. It is, however, important to note that some online Muslim conservative groups are active in “policing” gender segregation. This is evident from the growth of women-only online groups to share knowledge and thoughts particularly relating to Islam and women. Indonesian Salafi women, for example, have a strict screening process in their online groups to make sure that no men enter their online sphere (see Nisa 2013, p. 247), although, as Piela also argues, there is no guarantee that the screening process works because of the degree of anonymity of the Internet (2012, p. 7). In addition to this, social media enables them to reconcile the problems of women’s voice. Some ultraconservative groups emphasize that women’s voices are awra, which in this context refers to something that needs to be covered; this then has limited female preachers and religious teachers within this type of group to spread their Islamic teachings. Their understanding refers to the saying of the Prophet Muhammad that sawt al-mar’a ‘awra (a woman’s voice is an awra that needs to be covered). Hosni in her discussion of Islamist women and their activities in cybersphere also notes, “For some (the more conservative ones), the cybersphere offered a medium that would not violate their pious dressing nor their worthy-of-covering voices” (2017, p. 203). Through the Internet and diverse social media platforms, these women are able to conduct daʿwa by keyboard. Indeed, daʿwa by keyboard can reach not only female but also male audiences without violating their understanding of women’s voices. The agenda of these Islamist and ultraconservative women, however, usually differs from those of Islamic feminists mentioned above. The Islamist and other ultraconservative women support gender differences by emphasizing the concepts of equity and complementarity. Mir-Hosseini argues that according to those who support this understanding, “Differences in rights and duties…do not mean inequality or injustice. On the contrary, if correctly understood, they are in line with human nature, hence the very essence of justice” (2016, p. 69). In addition, these tech-savvy Muslim women are also active in arranging a variety of religious gatherings due to the assistance of diverse social media platforms, ranging from small religious gatherings and training to big events attended by thousands of participants (Nisa 2018b, p. 78). An online invitation from digital platforms, such as Instagram, WhatsApp, Facebook, and Twitter, is common and has become more acceptable. Although it does not replace a print invitation, an online invitation is not only cheaper but can also reach a broader audience. Social media penetration also allows digital platform users to recruit more attendees to their offline gatherings from more diverse backgrounds compared to the attendees of typical offline religious gatherings which are usually based on close family and social networks. It has become more common for social media users who have large numbers of followers to broadcast their offline religious gatherings through digital platforms. The loose characteristics of online membership make it appealing for anyone interested in joining this kind of religious gathering. Besides the offline religious activities, the online religious activities have now become more possible, such as streamed online Islamic study circles. Young tech-savvy Muslim women are also active in conducting lucrative and creative daʿwa. They combine the creativity of young, tech-savvy, daʿwa activists who create content to encourage other Muslims to be better Muslims through motivating posts and captions, especially through Instagram accounts, while at the same time conducting daʿwa business which caters to the needs of those who aspire to be better Muslims, such as self-help books about how to be hip, young, Muslim women (Nisa 2018b, p. 80) and modest Muslim dress which can emphasize the journey of pious improvement (Nisa 2018b). The following section will discuss Muslim fashion and the Muslim digital economy. Muslim fashion is one of the manifestations of Muslim women’s interest in the Internet and social media platforms. Scholars focusing their studies on fashion have emphasized the relations between fashion, the notion of the self, and identity – either individual or group identities (see Entwistle 2000). Studies often focus on how the way people dress signifies who they are, and in the discussion of faith and fashion, a dress can also inform one’s religious affiliation. Therefore, these studies often emphasize that dress communicates messages about its wearer’s identity. The rise of digital platforms has provided various doors for tech-savvy Muslims to communicate their identity through what they believe is proper Muslim dress. It is unsurprising to see the Internet and social media networks inundated by diverse expressions of Muslimness. The growing presence of hijabistas and Muslim fashion bloggers on the Internet is an important example. Hijabista is taken from a combination of two terms hijabi (a veiled woman) and fashionista. Kavakci and Kraeplin define hijabista as “a Muslim woman who dresses ‘stylishly’ while still adhering to the rules governing ‘modest’ apparel that coincides with Islamic dress code” (2017, p. 850). They usually use Instagram to spread their understandings of modesty and how to become a Muslim in the modern world. Before the birth of Instagram, many women used other media platforms such as blogs. Blogs have been used by many women not only to spread their understandings of femininity but also as a space to introduce their own version or alternative version of femininity from the mainstream (see Rocamora 2011). Rocamora, in her study of fashion blogs and bloggers, argues that “…the blogs represent a significant space of identity construction” (2011, p. 407). Social media platforms provide these women with a space for identity performance. Turkle also asserts, “it is computer screens where we project ourselves into our own dramas, dramas in which we are producer, director, and star. Some of these dramas are private, but increasingly we are able to draw in other people” (1995, p. 26). Hijabistas, and the many Muslim women who follow their steps, are fashion-conscious and embrace the visual affordances of diverse social media platforms, especially Instagram, to construct and perform their identity by posting self-portraits (see Beta 2014; Pramiyanti and Baulch 2017; Kavakci and Kraeplin 2017). In this context, they have the ability to self-express, self-represent, and self-modify their identities. Many social media users are aware that they are being observed by others, their followers, and onlookers, in general, especially if they do not privatize their accounts. Goffman’s dramaturgical analysis approach is resonant in this context of how social media users present themselves. Goffman argues that in the front stage of the theatrical performance, the performers are conscious that they are being observed (1959). Therefore, their front stage behaviors are adjusted to the expectation of the audience. Many of these Muslim women who are fashion-conscious also try to craft their presentation of themselves to gain their expected responses from online constituents. Pleasing their online audience to generate hundreds and thousands of likes often becomes the policing factors for these Muslim women. The awareness of being observed has helped the growth of Muslim fashion e-commerce. It is noteworthy that those who engage in the social media business are aware that they need to use the same tone as their audiences when catering to their business. Many Muslim women, especially young hijabista, focus their attention more on inspiring other young Muslim women to be confident wearing the veil while embracing the modern qualities of being a young woman. Examples include Halima Aden – former semifinalist of the 2016 Miss Minnesota pageant and the first veiled model to appear in Vogue and other magazine covers around the world – Hana Tajima, Ascia Al Faraj, and Dian Pelangi, designers and fashion bloggers. On the other hand, conservative and Islamist women usually use the term daʿwa when running Muslim fashion e-commerce. They run their businesses using religious rhetoric, such as “to help Muslim women find proper Muslim dress” or “for the sake of daʿwa,” especially those who believe that any activity can be considered daʿwa if they are aimed at inviting others to become better Muslims (Nisa 2018b, p. 71). Therefore, the Internet and social media provide these women a space to construct their identity, as well as a space to grow and explore their diverse interests, including engaging in consumerism and the commodification of their religion. The Innovation Group’s APAC of JWT Intelligence in 2017, for example, recorded that the Muslim consumer market has grown significantly, and Chen May Yee, APAC director, asserted that “the key markets of Malaysia, Indonesia, Singapore and Brunei are witnessing the rise of a new generation of millennial Muslimah [Muslim women], who are combining ambition and a thirst for lifestyle brands and digital channels with religious observances. They represent a burgeoning market for halal fashion, beauty, technology and food, and this market is rapidly developing” (2017, p. 4). In addition, people in the industry of Muslim consumer market, in general, have depended widely on social media to launch and announce their products, including sales and special events (The Innovation Group’s APAC 2017, p. 33). Chen May Yee conveyed that “the number of digital consumers in Southeast Asia has climbed by 50% over the past year to 200 million, according to business consultancy Bain & Company” (The Innovation Group’s APAC 2017, p. 4). The growth in Muslim fashion e-commerce has also been strengthened by the increasing popularity of various digital platforms, including selfie culture among tech-savvy young Muslim women. A selfie is a photograph of oneself taken by holding a smartphone with one arm or a selfie stick and is shared on diverse social media platforms, such as Instagram, Snapchat, and Facebook. Studies on taking selfies mention that women take more selfies than men. Before the popularity of photo-sharing formats, Muslim fashion magazines presenting the latest fashion style and halal (lawful) beauty products were popular. Similar to today’s digital platforms, print media, in particular, Muslim women’s magazines, have long been seen as an effervescent space for identity formation, self-expression, and self-representation. The ideologies behind Muslim women’s magazines vary, ranging from the progressive, moderate, to radical ideologies. In March 2011, for example, Al-Qaeda’s media wing launched Al-Shamikha (The Majestic Woman), a 31-page women’s magazine which not only provides advice for women to contribute to Al-Qaeda’s extremist agenda but also about beauty and fashion. In Indonesia, Islamic lifestyle women’s magazines have played a vital role in merging devotion and consumption. These Islamic lifestyle women’s magazines have become a venue for women displaying their religious identity through certain modest dress. According to Jones, the presence of these magazines signifies “…the twin industries of Islamic fashion and fashion media…” (Jones 2010, p. 92). Islamic women’s magazines in Indonesia support and encourage diverse expressions of Islamic identity. The growth of halal business had been supported by the presence of diverse glossy Muslim fashion magazines that displayed selections of fashionable items classified as pious or modest fashion. These fashion magazines exhibited slender models with Muslim dress to project the reflection of modern Muslim women’s bodies. Today, however, Muslim fashion magazines have passed peak popularity; thus some have transformed into e-zines (electronic magazines). Differing from print media in which the scope of coverage can be limited to certain localities, e-magazines can reach a wider readership across the globe. Besides e-magazines, digital platforms have led to the mushrooming presence of hijabista assisted by social media platforms, selfie culture, and Muslim fashion e-commerce that have given birth to various microcelebrities – also known as the cyber famous, the nontraditional celebrities or models used by fashion brands to endorse their products and brands – who do not require magazines in order to be famous and maintain popularity. Being famous, for many young tech-savvy Muslim women, is no longer an out-of-touch dream. Their digital literacy goes hand in hand with their ability to develop self-branding using digital media. Banet-Weiser elaborates the phenomenon of self-branding using digital media through her analysis of lifecasting, referring to broadcasting “every moment of one’s everyday life in real time” (2012, p. 75). Lifecasting, according to Banet-Weiser, is the quintessential self-branding example through which “the self is a product, promoted and sold by individual entrepreneurs” (2012, p. 76). Furthermore, she defines the media-savvy girls and young women in her study, who participate in interactive technology, as “interactive subject” referring to “an individual who can move between and within media platforms with ease, and who can produce media online, whether in the form of videos, blogs, or even through comments and feedback” (2012, p. 56). Tech-savvy young hijabistas today have developed self-branding prominently through Instagram. Becoming Instagram famous or instafamous, by generating a great number of followers on Instagram, for example, has been the concern of many hijabistas who are Instagram users. The interplay between the Internet, social media platforms, and e-commerce has resulted in young Muslim microcelebrities paying greater attention to their self-presentation. These tech-savvy Muslim women often “voluntarily” make themselves available as objects of gaze through diverse social media platforms. The photos they deliberately upload are statements announcing they are ready to be looked at. They feel empowered because they can create self-contentment by generating likes from followers and onlookers and can control the presentation of their own bodies without being dictated to by “regimes” trying to standardize certain body types and their fame is not driven by outside tastemakers, including “fashion designers, magazine editors, authors, apparel companies, and salesclerks” (Bucar 2017, p. 180). They craft their own profile to gain more followers. Having thousands of followers allows them a chance to be known as great influencers. The presence of Muslim microcelebrities and e-commerce in general also accentuates diverse understandings and voices of modesty and what modesty entails for women. The Internet and its diverse social media platforms have played a pivotal role in closing the gender gap. Muslim women living in conservative countries, like Saudi Arabia and Kuwait, for example, have found these products of advanced technology as providing a liberating platform. The Internet allows them to bypass traditional gender segregation. They can build, strengthen, and expand their social and political networks. In addition, the anonymity of cyberspace has provided many Muslim women the chance to have more freedom in expressing their identity and belonging, including religious affiliations. They can speak freely, including initiating changes and criticizing as well as resisting political, religious, and social authorities in the convenience of their homes, without being afraid of violating conservative norms. Diverse Islamic groups have used the Internet for their own agenda. Muslim women from diverse ideological affiliations have also used the Internet for their diverse interests. Some Muslim women activists, including Islamic feminists and their groups, use the Internet and social media platforms to invite and empower other Muslim women to voice their concerns, due to the marginalization and harassment that Muslim women experience globally. Some Islamic feminist groups are also active in managing websites containing their agenda to counter misogynistic understandings of Islamic texts and to fight for gender justice. In addition to this type of Muslim woman, who uses digital technologies to make egalitarian understandings of Islam more visible, there are also other expressions of Muslimness by Muslim women in the Islamic public sphere online ranging from Islamist women to ultraconservative Salafi women who indeed try to strengthen gender differences by using the concepts of equity and complementarity. They argue that differences in gender rights and duties are resonant with human nature. In the realm of daʿwa, despite the mounting number of ulama who have taken benefits from the presence of the Internet and social media networks in their daʿwa, these advanced digital technologies have provided unparalleled opportunities for tech-savvy Muslim women to be “new interpreters” of Islam. The mushrooming number of creative content creators of daʿwa on Instagram, for example, has intensified the fragmentation of online religious authority and the proliferation of a fragmented Islamic public sphere online. In addition to this, the presence of Muslim women who follow diverse daʿwa websites has also strengthened the atmosphere of intra-Muslim divisions. The Internet becomes particularly important for young women who want to construct and perform their specific desired religious identity online. Scholars have argued about the importance of the role of the Internet in empowering its users to be creative in creating and establishing their religious identity online. This can be seen in the discussion above, especially how young tech-savvy Muslim women creatively craft their religious identity online. Social media platforms, for example, have enabled fashionable young Muslim women to find a malleable platform that provides the opportunity to express their religious identity and religious practice in their most desired ways. These women develop diverse skills and creativities through the assistance of the Internet and social media platforms, including developing e-commerce businesses, as evidenced by the Muslim fashion industry, and becoming social media influencers receiving endorsement invitations by well-known brands to present their products. Before the growth of social media platforms, scholars of Muslim fashion often saw Muslim fashion in the context of the relationship between Muslim fashion – including veiling – gender, religion, culture, politics, and economics. Today, the Internet, and in particular diverse social media platforms, has led to the rise of microcelebrity Muslim women who are confident and in full control of crafting their identities and at the same time engaging in lucrative businesses. Therefore, the interplay between technology – the Internet and social media – faith, and women demonstrates dynamic and continuous engagements of these elements, especially in the study of what it means to be a Muslim woman in the digital age. Amidi, F. (2018). 100 women: Muslim women rally round #MosqueMeToo. BBC News. https://www.bbc.com/news/world-43006952. Accessed 29 Aug 2018. Grant, S. (2017). Men vs women social media usage. https://www.linkedin.com/pulse/men-vs-women-social-media-usage-stefanie-grant. Accessed 29 Aug 2018. Larsson, G. (2017). Islam and the internet. http://www.oxfordbibliographies.com/view/document/obo-9780195390155/obo-9780195390155-0116.xml?rskey=gbkjFM&result=9&q=islam+and+music#firstMatch. Accessed 2 Aug 2018. Nisa, E., & Faried, F. S. (2018). Female suicide bombers: How terrorist propaganda radicalise Indonesian women. The conversation. https://theconversation.com/female-suicide-bombers-how-terrorist-propaganda-radicalises-indonesian-women-98143. Accessed 27 Aug 2018. Piela, A. (2018). Internet, blogs, and social networking. The Oxford encyclopedia of Islam and women. http://www.oxfordislamicstudies.com/article/opr/t355/e0134. Accessed 26 Aug 2018. Pramiyanti, A., & Baulch, E. (2017). Hijabers of Instagram: The Muslim women challenging stereotypes. The conversation. https://theconversation.com/hijabers-of-instagram-the-muslim-women-challenging-stereotypes-79416. Accessed 27 Aug 2018. Vermeren, I. (2015). Men vs. women: Who is more active on social media? Brandwatch. https://www.brandwatch.com/blog/men-vs-women-active-social-media/. Accessed 29 Aug 2018.